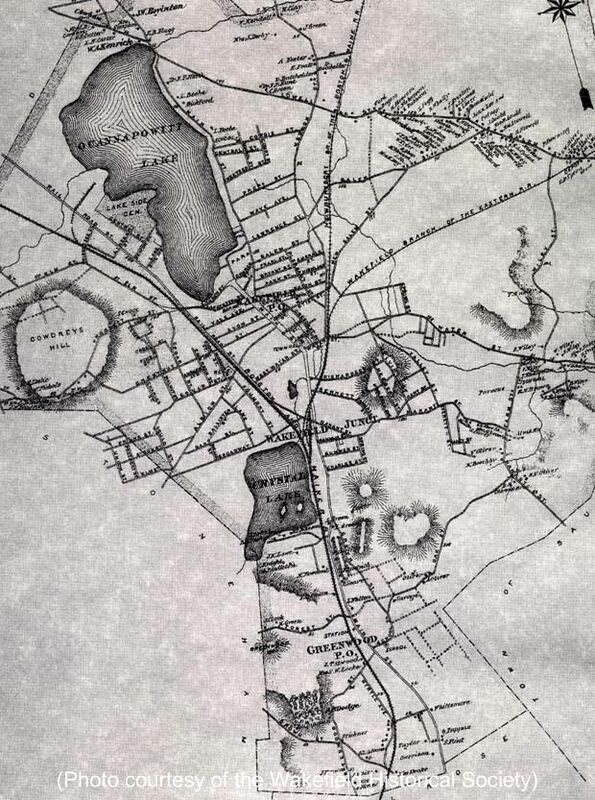 "The 1875 map of Wakefield features large estates, streets and landmarks, as well as railroads and town boundaries. Several of the streets have been renamed since 1875, including Brown Street (now Spring), Wiley Street (now Montrose Avenue), and Railroad Street (now North Avenue). There was a Pine Street off Cedar Hill Avenue (now Fairmount Avenue), a Spring Street off Water Street, and a Charles Street off Chestnut Street. The map also features the Newburyport and South Reading Railroad lines and their stations." -- Text from calendar by Jayne M. D'Onofrio. “Map of Wakefield, 1875,” NOBLE Digital Heritage, accessed April 20, 2019, https://digitalheritage.noblenet.org/noble/items/show/7026.